Vintage Image Tin Metal Signs with a Nostalgic and Retro Look and Feel! 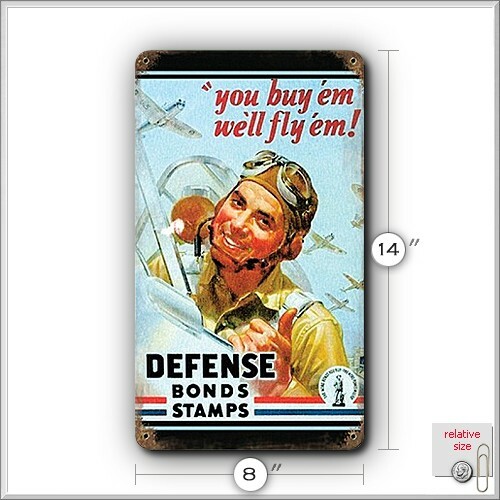 WWII - Defense Bonds Stamps, Tin Sign, Nostalgic Retro Vintage Metal Reproduction, WW2 Posters. Unlike most other tin sign reproductions, these NEW metal signs are hand-crafted, one at a time, right here in the U.S.A. using high quality 24 gauge American STEEL. They are EXTREMELY durable, not as flimsy and easily bent as their more economical tin cousins. The image on this metal sign is applied by a special process where it is baked into a powder coating for an attractive and long lasting finish, the closest possible replication of a vintage original. Each sign is then finished and inspected by hand. This World War 2 tin metal sign is a fully licensed product, the ideal and affordable nostalgic decoration for any room or work environment!